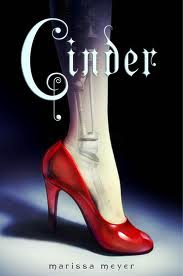 Cinderella has been re-told every way possible, why not in science fiction? The cover is great too isn't it?! I'm actually blown away at the brilliance of a science fiction Cinderella. It has everything going for it. All the elements of the classic fairytale are there, but then there are a bunch of other stuff going on. It has an Asian setting, there are people living on the moon, cyborgs and androids all over the place, and a deadly pandemic! It may seem with all those things going on it might be a bit much, but it isn't. Trust me! It just makes everything so uber cool. I enjoyed it! The ending was a bit sad for me, but knowing there are more books makes me believe that Cinder will win this all in the end. There will be a Quartet of books in the series. I can almost see them each taking on a classic fairytale and being re-told in this science fiction world. I'm so looking forward to Scarlett out next year! "Imagine there was a cure, but finding it would cost you everything. It would completely ruin your life. What would you do?" Check out a sample of the Audio Book! Great review. I've been really wanting to read this. You've got me more excited. @Natalie I have never read a science fiction fairytale re-telling so I wasn't sure what to expect, but it was great! It actually makes me want to try the genre a bit more. Hope you enjoy it! I just bought Cinder yesterday and I am so excited to read it. This review and the quote just made me want to put aside my current book and start it tonight. I'm glad to know that all the sci-fi elements don't overwhelm the fairy tale aspect of the story. I just finished this book and LOVED it!! Can't wait for the next one! I can't believe I turned down a hard copy of this because I'd already requested it on Net galley...to then find it archived when I went to download...argggh! @thekams I'm a fantasy fan, but not really read much sci fi, but I really enjoyed this. It was light science fiction and the fairytale just made it even better. @Vanessa I am itching for the next book already! @Vicki AH! I hate when that happens! Great review :) It sounds fabulous! Glad you enjoyed it! :) I'm looking forward to the next book too!